I was brought up to believe that food is a precious commodity that deserves to be revered. Coming from a deeply religious Hindu family, the concept that food is to be treated with the same respect and devotion as God was one that got ingrained into my conscience at a very early age. My parents never spared any opportunity to reinforce the belief that to waste food willy-nilly without a just cause was nothing short of a sin! The concept was difficult for me to fathom as a child, especially as I was fortunate enough to have enough on my plate and more, at any meal of any day. As I grew up, I became more and more aware of the reason behind my parents' insistence on avoiding food waste. While there are many of us living in comfort and taking all our meals for granted, there are those who are not so sure about where their next meal is going to come from, if at all. Contrary to popular belief, it is not just people in the developing countries around the globe that are facing the horror of starvation. It is very unfortunate that there are families right here in the UK for whom hunger is only too real. New research out in November this year shows that not being able to feed ourselves or our children is a very real concern for many families across the UK. 42% of households consider it difficult to live on their income, with 20% of these struggling families borrowing money from family or friends in order to feed themselves and their children. Shockingly 22% of the parents in these families even go without food so that their children can eat. Yet 75% of us continue to throw away food that could have been eaten. Unilever have launched Project Sunlight with the hope to make this world a better place for our children to inherit. The #ClearAPlate campaign is an off-shoot of this project. Working in partnership with Oxfam, the aim is to 'waste not, want not', to provide meals to struggling families here in the UK. It really does not take a lot of effort to stop food waste. Here are 5 really simple ways by which you can stop food waste and do your bit to put an end to food poverty. 1) Meal planning: Try and chart out a weekly plan for all your meals. That way, you will know exactly what and how much of anything you need to buy. It will help you budget better as well. 2) Shopping lists: This is the next logical step to meal planning. Once you know what you are eating through the week, it is only right that you list out all that you need to buy to make those meals. I find shopping lists extremely useful when I do my grocery shop. They allow me to stay focussed on what I actually need to buy, rather than being distracted by all the promotions on supermarket shelves. Doing your grocery shopping on-line might be another useful way to stick to your shopping list and budget and to avoid being carried away by promotions. 3) Use by and Best before: The Food Standards Agency (FSA) has clear guidelines with regards to 'use by' and 'best before' dates on food packaging. 'Use by' is for perishable foods that go off quickly, like meats, ready-prepared salads and other products in chilled cabinets in the supermarket. Eating products after the 'use by' date can prove to be a health hazard. 'Best before' is for frozen, dried, tinned and other foods. This is more about quality than safety. Eating something beyond its 'best before' date doesn't mean the food will be harmful, but it might begin to lose its flavour and texture. Knowing what can be eaten and by when can go a long way in avoiding waste. 4) Safely store and use leftovers: This is a key factor in avoiding food waste. Simple, small steps like freezing extra portions, refrigerating left-overs and creating new recipes with them can make all the difference between salvaging food and binning it. Instead of throwing out those black, over-ripe bananas, try baking with them. The result is guaranteed to bring a smile to your face. 5) Portion sizes: This is such a small change to adopt in our everyday lives, but one that can make a huge impact in the long run. Instead of taking huge portions and then throwing leftovers in the bin, just take smaller portions to start with. You can always go back for seconds. You may even notice a shrinking waistline as a side-effect! Five really simple things that can make such a big difference. Not only for the cause of preventing food waste, but also to your pocket. Think about how much you will save in a year as a family by incorporating these small little changes in your daily routines. We are on the threshold of a new year, a time to make new resolutions. A time to act against food poverty and to do your bit to put an end to food waste. I have joined forces with Unilever and the #ClearAPlate campaign to bring you a competition, one that will hopefully inspire you to pledge your support to this cause. One of you, my readers, are in with a chance of winning a fantastic hamper worth £50. 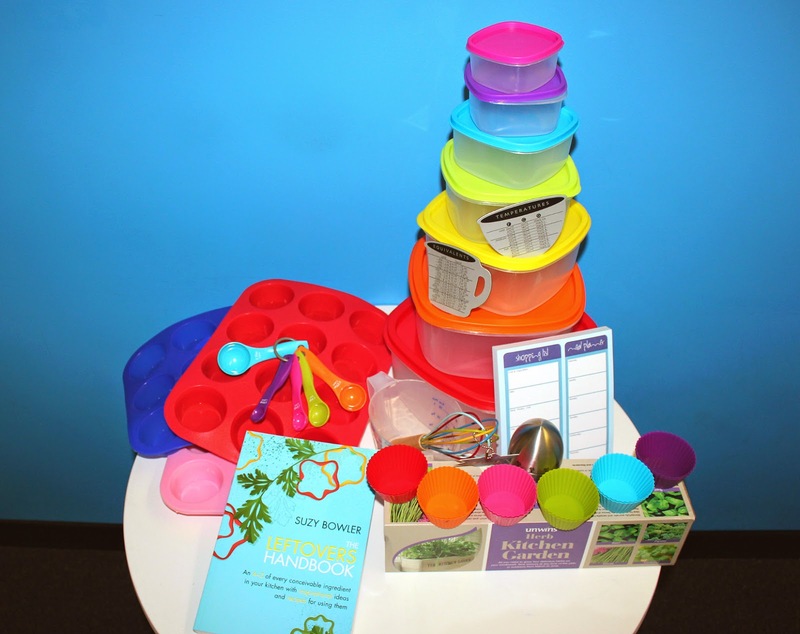 It will include a colourful kitchen whisk, measuring spoons, fridge magnets with imperial/metric conversions, a measuring jug, multicoloured stacking food containers, reusable cupcake cases, an egg timer, a shopping list/meal planner notebook, a window planter with seeds and a Leftovers Cookbook. You can enter via the Rafflecopter widget below. Good luck! 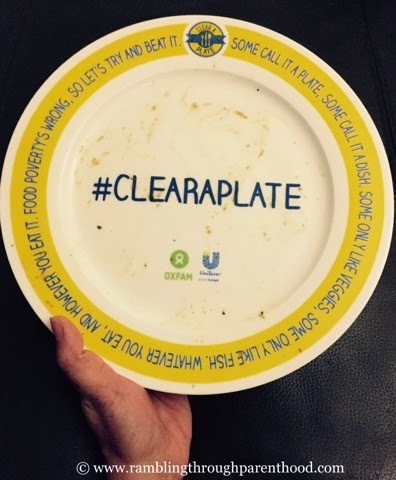 Disclaimer: I am running this competition on behalf of the team at Unilever and #ClearAPlate. I am also linking up with Mumsnet in the hope of winning a pair of tickets to BlogFest 2015. I have not received any compensation to do either of these things. My tip is when planning your week's meals, leave one day unplanned and make a meal out of whatever is lurking around unused in the fridge or cupboards. It means things get used up and also encourages you to be creative - you'd be surprised what you can produce. Soups, flans, pasta sauces, pizzas and risottos made out of scraps can turn out to be masterpieces! Serve smaller portions and let everyone help themselves to seconds only if they are still hungry, then any food still left can be saved for the next day. Freeze stuff, lots more can be frozen than you think. Use meal planners. By planning a string of meals in advance, you know exactly which ingredients you’ll need and can adjust what you buy accordingly. You’d be surprised at how much wastage is stopped by taking the guesswork out of shopping! I started doing this in January and have save loads and wasted less! Plan all meals in advance and then buy only what you need for that week. Freeze as much food as possible but don't forget to actually eat it eventually! I always plan meals, hate to waste food - wastes money and creates more landfill. Start with a small portion, eat more if you finish it, or freeze the rest. Periodically go through your cupboard to see what's getting near its end date. Plan some meals around those items. I did this right before we moved, and it really helped. I like the idea of using your leftovers to make soup. I freeze leftovers, yesterday I made dinner of steak pie and mash using beef stew that had been frozen and leftover mash, that had also been frozen, I only had to make some pastry and dinner was done. Use leftovers next day and freeze portions. What's in the fridge soup. My daughter used to like soup or pasta sauce days depending on what veg was lurking at the bottom of the fridge. Cheap and easy to do. If you make more than you need, freeze in portions for homemade ready meals. Measure out your pasta before cooking it. Plan ahead so you don't buy extra! Plan meals and only buy want you need. Serve up smaller portions, allowing more of their favourite items only when the plate has been cleared. always look through what you have before shopping to save you buying those offers that you really don't need! When cooking, use every piece of the food you’re cooking with. For example, leave the skin on vegetables, cook the tasty broccoli stems along with the florets,. Skins and stems often have provide additional nutrients. weekly shopping based on meal plans! Don't be tempted by BOGOF offers on stuff you don't need. Use leftovers .. like on mince on jacket potatoes, or shred lamb, chicken meat into salads. Left over curry goes into flatbreads nicely. Or, freeze, until you can use them. Plan meals and write a shopping list so you only buy what you need. Make meals spread as far as possible - eg. a pan of mince can do 3 days meals - Mince day 1, Spag Bol Day 2, Chilli Con Carne Day 3 all by just adding a few more ingredients each day. Freeze leftover food. People in the UK waste too much food! Buy things that can be used in several simple dishes such as courgette which is great with pasta, in a bolognese, on pizza, in a ratatouille as a side for meat or fish. Plan your meals and only buy what you need so you don't have loads of food you can't possibly get through before it goes bad. Only buy what you need which you can only do if you plan. When it goes wrong freeze it and then re-plan using it. Don't throw food waste away, put it in the compost. Freeze leftovers IMMEDIATELY. In my house if they stay in the fridge for a couple of days, I don't bother freezing them, whereas if they're in the freezer straightaway, it's all done and dusted. I make enough for 2 meals, that way if anyone wants seconds they can and i'll just freeze what's left or eat the next day! Cook in bulk for the week and freeze meals. I need to start meal planning so that I am buying less food and therefore wasting less food. Make and cook larger portions , then freeze and use as needed. Only overbuy tinned goods which last. freeze stuff more and look at receipes for left over food which I do a lot of! If you can buy veg to the amount you want rather than the pre packaged stuff at the supermarkets, it saves money and waste! I meal plan and write my shopping list from my plan each week. This really helps me to reduce waste. Think before you throw - think if you can recycle or compost the waste. Invest in some cheap Tupperware containers. You can use these to store any leftovers from meals in the freezer to be eaten another day. Plan ahead for each meal, that way you don't purchase more than you need which leads to waste. Don't buy more than you need, even if there is a BOGOF offer. Definitely a meal plan and I will be doing this starting tomorrow! Eat only what you like. Check your fridge and cupboards weekly and keep an eye on the dates. Pull to the front things with a short date and make sure they're used. Also don't get fooled into buying things just because they're on offer. It's not a bargain if you're going to throw it in the bin! Meal plan, make a shopping list & stick to it, cook two meals eat one freeze one so there is always something to heat up. Plan meals making sure you use up leftovers or freeze them. We have lots of meals to be made from leftover roast meat for example. It never gets dull! Don't be tempted by something just because it is on promotion - only buy as much as you will use. Plan meals and use leftovers for lunch the next day or freeze extra portions.